The brooch is made of gold studded with diamonds, and it takes the form of a loosely-knotted ribbon. 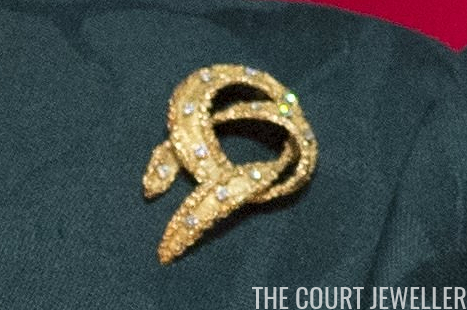 I've heard some say that they think the brooch is meant to resemble a snake, and I can understand why the coiled shape would suggest that, but I think it's meant to be more abstract than that in its design. The piece has been in Anne's jewelry box for a whopping five decades. 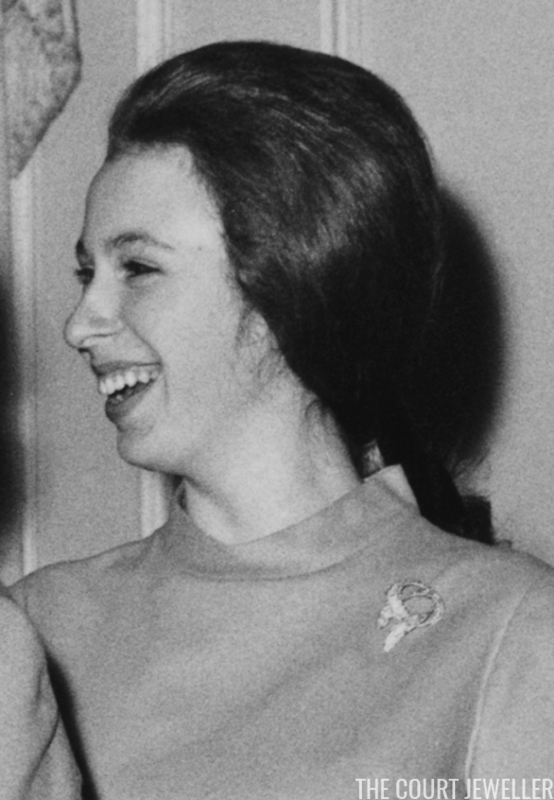 Above, she wears the brooch at Buckingham Palace in February 1969. The occasion: meeting and greeting Colonel Frank Borman, the American astronaut who served as commander of the Apollo 8 mission. 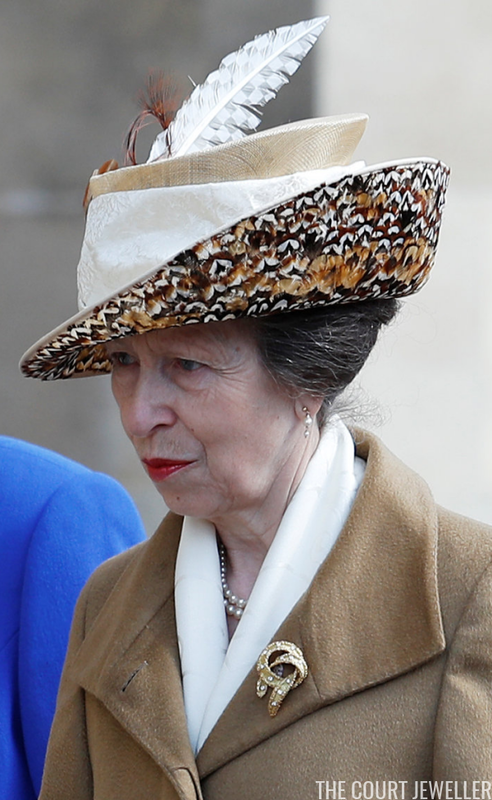 Almost half a century later, Anne's still wearing the brooch. (This should come as no surprise to those who know about Anne's penchant for recycling clothing.) She generally reserves the piece for daytime wear, though she has chosen it for some significant events, including a trip to Washington, D.C. in November 2014 to open an exhibition about the Magna Carta. 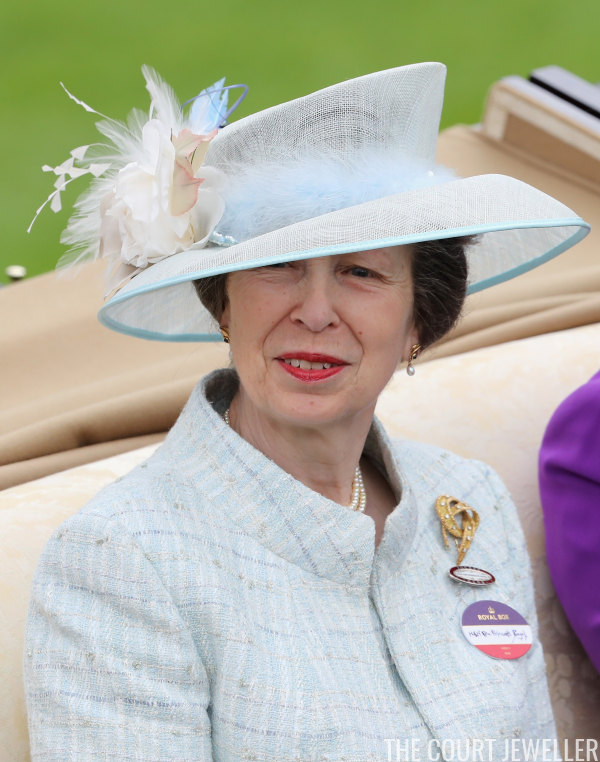 During her trip to Washington, and on numerous other occasions, Anne has paired the brooch with a pair of diamond, pearl, and gold earrings made by Andrew Grima. 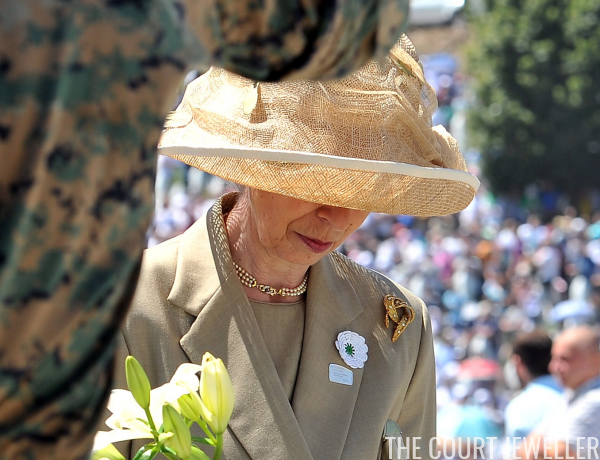 She wore that combination of jewels above for the ANZAC Day Dawn Service in London in 2015. I've often thought that it's possible the brooch might also be a Grima piece, but I've never read any confirmation of that. 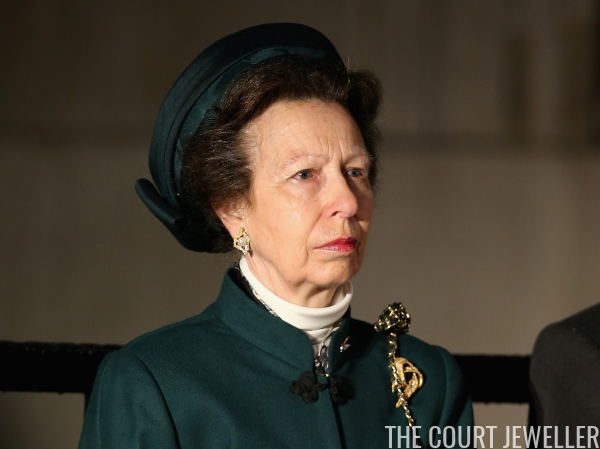 Regardless of its provenance, the brooch has been a versatile workhorse in Anne's collection. The piece is suitable for occasions where understated jewels are appropriate, like this July 2015 remembrance of the victims of the Srebrenica massacre. The ribbon brooch also works for more upbeat events, like the annual Royal Ascot races. Anne wore the brooch with this pale blue ensemble at Ascot in June 2016. 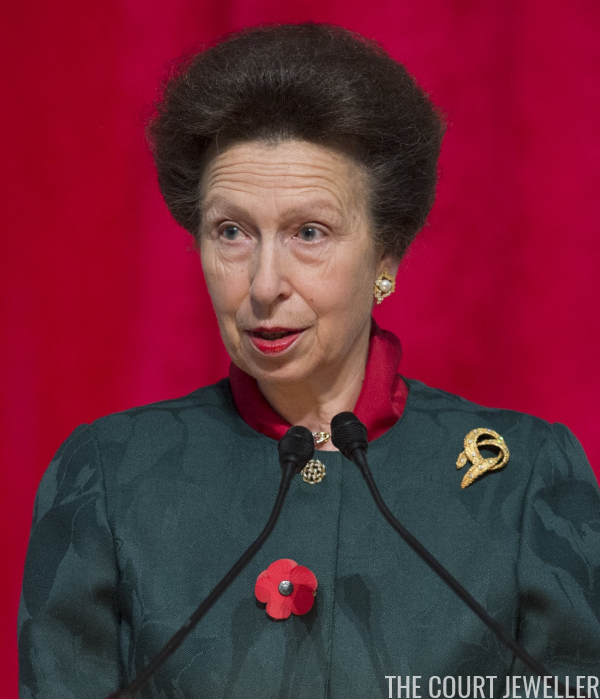 And for two years running, she's chosen the brooch for Easter Sunday services at Windsor. 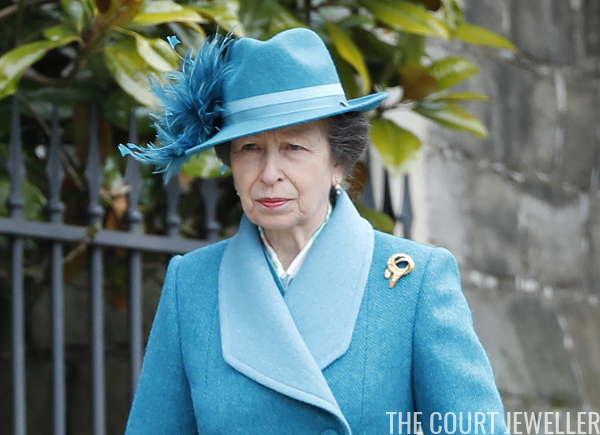 Above, she wears the brooch on Easter in April 2017, and at the top of this post, you'll see an image of Anne wearing the brooch pinned to a blue coat on Easter Sunday in April 2018. Anne can also be seen wearing the brooch in one of my very favorite British royal photographs: this image, taken on Valentine's Day in 2007. 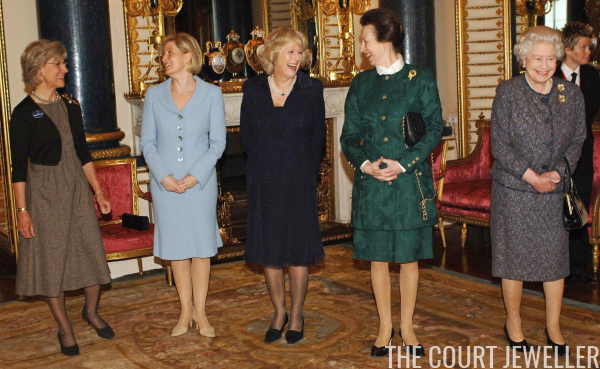 The Windsor women ditched their spouses at lunchtime that year to attend a Women in Business Reception at Buckingham Palace, and the looks on their faces suggest that they're not missing the boys at all!